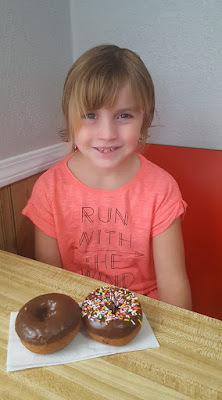 Yup, it was my youngest birthday this past weekend and for her birthday breakfast she wanted DONUTS...so DONUTS is what she got! Her day continued with whatever her heart desired because it was HER day. So we went to the park and had a picnic for the afternoon. Then she chose HER birthday dinner. Any guesses? Meatloaf, Mashed Potatoes and Peas/Carrots! Who knew? I didn't know that this has now become her favorite dinner. And now onto her "friend" birthday party that we are having this weekend! In light of us returning from Hawaii a couple weeks ago, she decided on a Luau themed party. I have a few tricks up my sleeve to pull this off. I will share what we did hopefully next week and post some pictures too. Happy 8th Birthday Miss Kay!